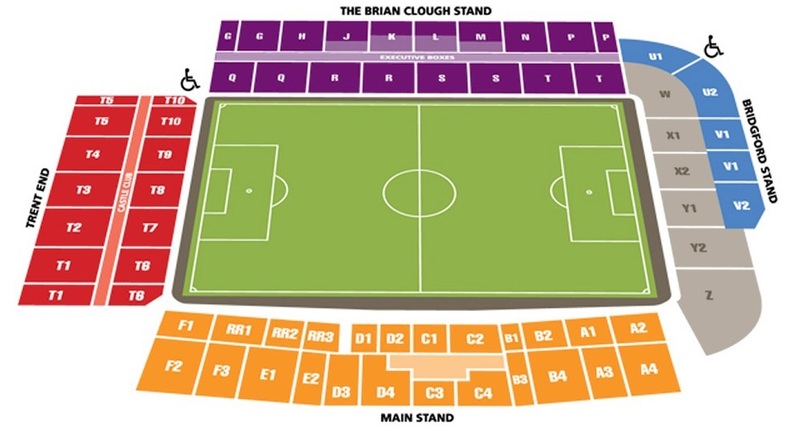 The City Ground has an all seated capacity in excess of 30,500 and is situated only three hundred yards away from Meadow Lane, home of Notts County. The Main Stand is the oldest stand in the ground and it shows when you look at the quality of the three newer builds. The Trent End is behind the goal and seems to be home to some of the more vocal fans, whilst opposite is the Bridgford stand which accommodates visiting fans. Running the other side of the field is the newish Brian Clough stand which is a very impressive two tiered build. There are very few bad seats in the house. Visiting supporters are situated in the lower tier of the Bridgford stand and you will most likely get around 3-3,500 tickets although the full allocation if taken can stretch to 4,800. To get to the turnstiles go through The Brian Clough Stand car park via Scarrington Road off Lady Bay Bridge. The view is very good with unobstructed views throughout. However, on a rainy day, avoid the front few rows as the roof doesn't cover them and you'll get incredibly wet. Facilities are very good and the food is well priced with the general array of burgers and pies. The Larwood and Voce is about five minutes walk from the away end on Fox Road, just off Radcliffe Road. It welcomes away fans and serves food so it might be a good place to have some pre match banter the locals. Just down the road from the Larwood and Voce is the Stratford Haven which also does food. There is a large car park at the ground where both home and away supporters are able to park at a cost of £5 per car. Alternatively, there is some street parking providing you arrive early enough. Another option is the secure car park on the Victoria Embankment, located near to the cricket ground. It's priced at £3 and is only a two minute walk to the stadium. The nearest / closest train station to Nottingham Forest's City Ground is Nottingham rail. 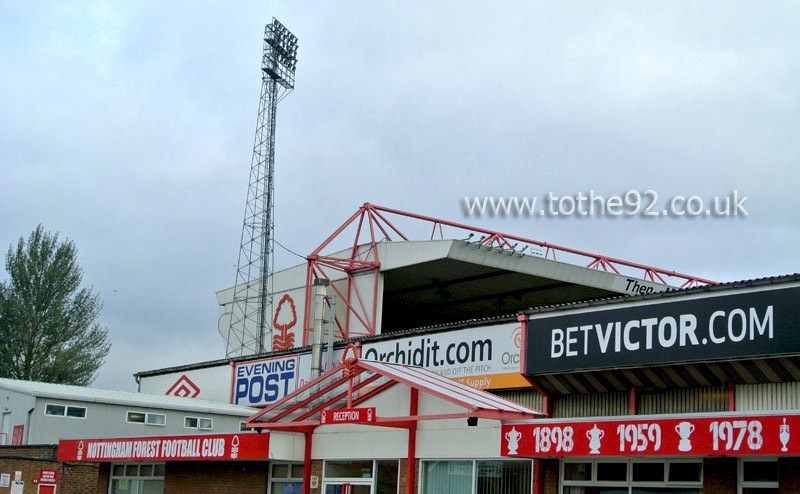 The City Ground is approximately 20 minutes walk from the station. Leave the station through the main entrance and turn left onto Carrington Road. Continue along this road whist it changes through the different name and eventually becomes Meadows Way. Follow the road for half a mile until it joins London Rd. Take a right over the bridge and the stadium is visible on the left hand side. Travel: I drove and parked in the Notts County Sports bar car park which was free. Getting away was about 15 minutes (but quite a walk if you have walking difficulties) from Forest ground. Refreshments: Notts county sports bar club opens its doors on match days to away fans and there was a good choice of beers. Food was ok but not brilliant with not a lot of choice. Staff were ok but waited ages to get served. Impressions: Stewarding / Management of away fans was poor with only 1200 visitors. We were hemmed in like sardines despite banks of empty seats all around. View was poor due to standing up throughout the game by our own fans. Atmosphere again was sterile..
Facilities: Food was expensive but was hot. Toilets were ok. Enjoy: Marks out of 10 would be 6. The County bar was ok but disappointed with lack of atmosphere by Forest Fans. 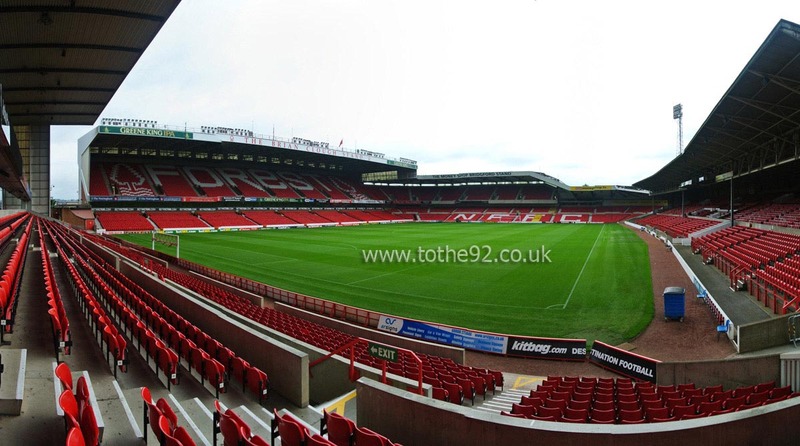 Have you been to Nottingham Forest's City Ground? To tell us about your experiences and to feature on the site, simply complete the fans review form below!